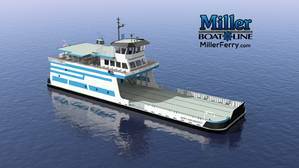 Miller Boat Line has ordered a new drive-on, drive-off passenger/vehicle ferry for delivery from Superior, Wis. builder Fraser Shipyards in fall 2019. The new ferry will be delivered from Lake Superior to Lake Erie and her new home port of Put-in-Bay, Ohio. The 140-foot-long, 38.5-foot-wide newbuild will be able to accommodate 26 standard sized vehicles or 600 passengers and will join Miller's present fleet of four passenger/vehicle ferries, which operate between the peninsula of Catawba to Put-in-Bay (South Bass Island) and to Middle Bass Island, Ohio - two of Ohio's popular Lake Erie resort islands. The new ferry will be christened Mary Ann Market in honor of the company's late owner. The M/V Mary Ann Market will feature enhanced propulsion and maneuverability, a main deck ADA accessible passenger cabin and restroom, and a 20 percent increase in cargo capacity over Miller's current largest vessel.